We are having friends over for brunch both Saturday and Sunday, so I am going to make this strata adding my own twists. Love that I can make it in advance. We are also going to a party and it is going to be hot, so I am going to wear this dress (on sale) to keep cool. I have still made no progress on the house, but I will at least try and hang my favorite nursery prints up in the little man's room. And maybe, just maybe, I will make a rug decision for the family room. Leaning towards this one, since it seems durable, soft, versatile, and the price is right in case I change my mind and have to move it to another room (probably happening). I found the perfect room for inspiration for the master. A great mix of masculine and feminine. I am also shopping around for moving announcements and love these postcards. Already have the Opening Ceremonies set to DVR tonight. Fast forward is crucial for the hours long parade of athletes. Looking forward to slightly cooler temps so I can pop open a bottle of one of my favorite wines and actually sit outside. 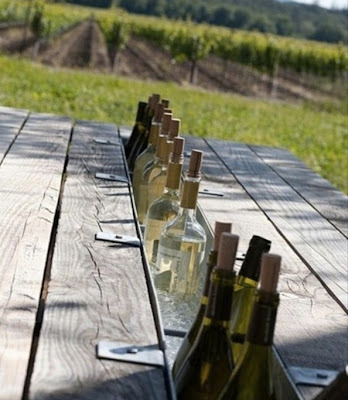 Wish I had this table, it's genius. I hope you get to enjoy yourself and relax.